Please note that these are theater classes and may have a fee to participate. Roald Dahl’s timeless story of the world-famous candy man and his quest to find an heir comes to life in this stage adaptation of Charlie and the Chocolate Factory. 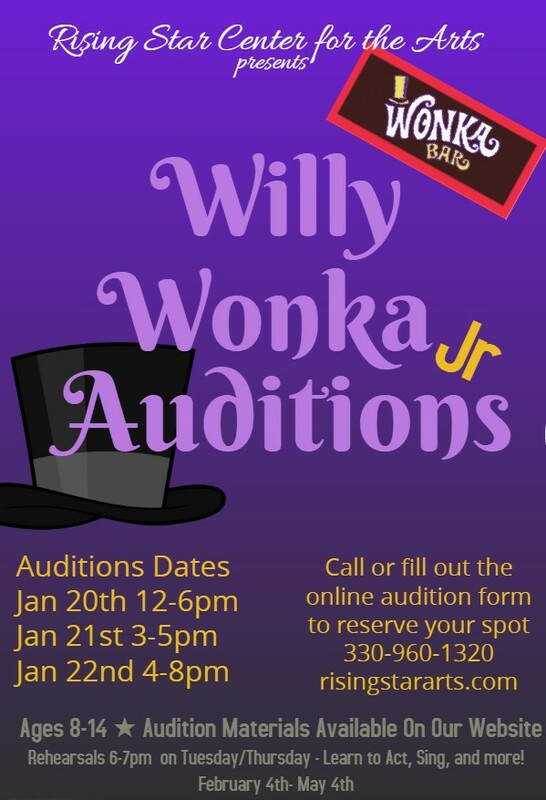 With a flexible cast size, a tour-de-force role for the title character, songs from the film classic and some clever new additions, Willy Wonka Junior runs 60-70 minutes and will delight performers and audiences alike! Songs include: Pure Imagination; Golden Age of Chocolate; The Candy Man, and more! Rehearsals are Tuesday/Thursday 6-7pm February 4th-May 4th and take place at our location in downtown Akron, Ohio. This is part of Rising Star Center for the Arts educational theatre program where children will learn to act, sing, dance and more. All levels of experience are welcome. This show is for children ages 8-14 but we have another show at the same time for other ages. Please email admin@risingstararts.com or call 330-960-1320 for additional questions.